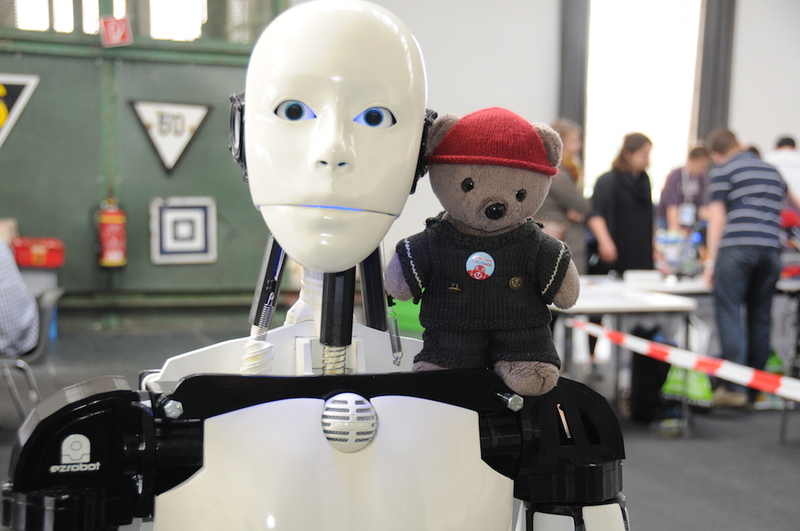 Last weekend the first MakerFaire took place in Berlin. 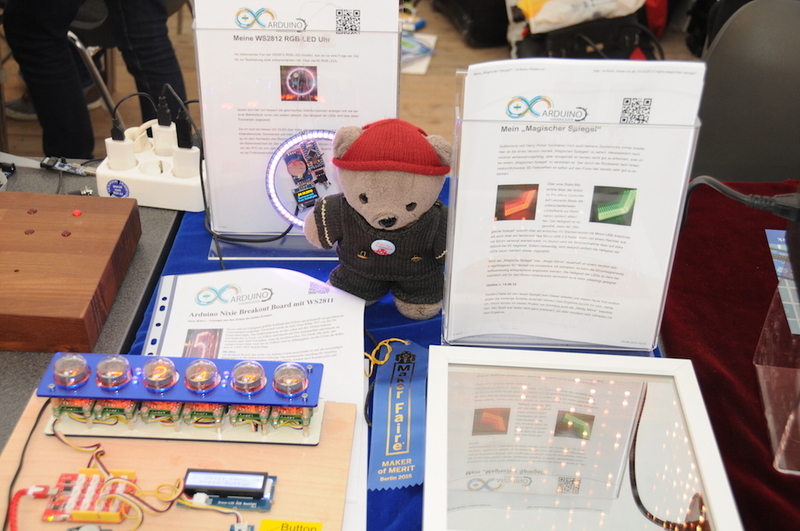 The Arduino group Hannover participated to present their projects. 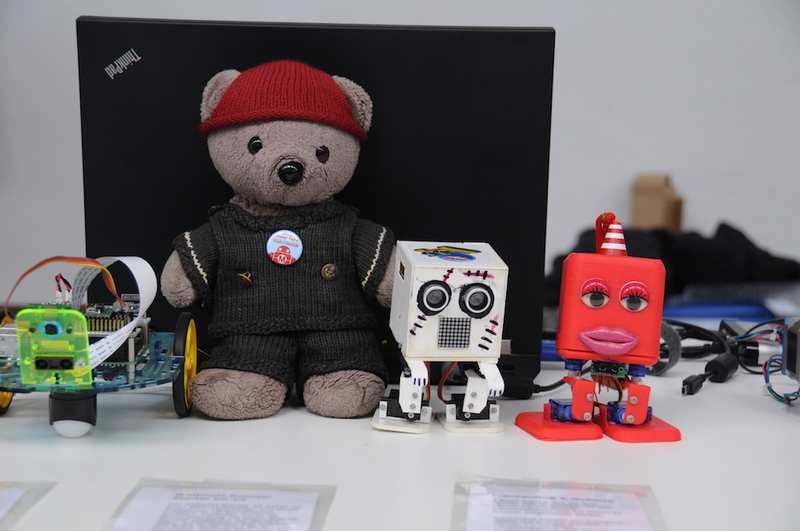 For the first time Daniel the MakerBear accompanied us. 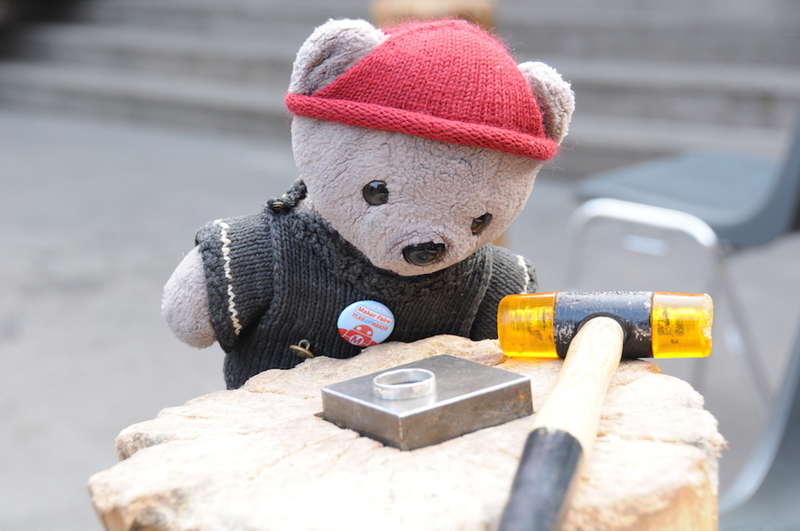 Here is the story of his adventures as a guest post. 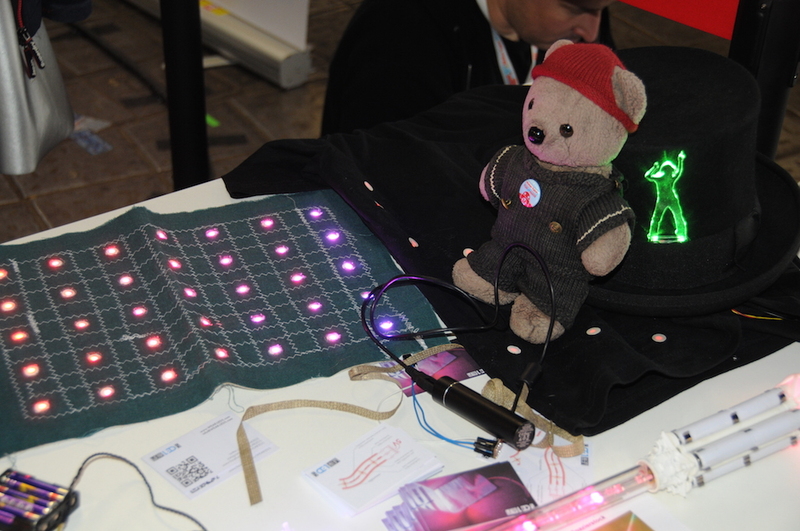 The booth of the Arduino group Hannover was constantly beleagued. 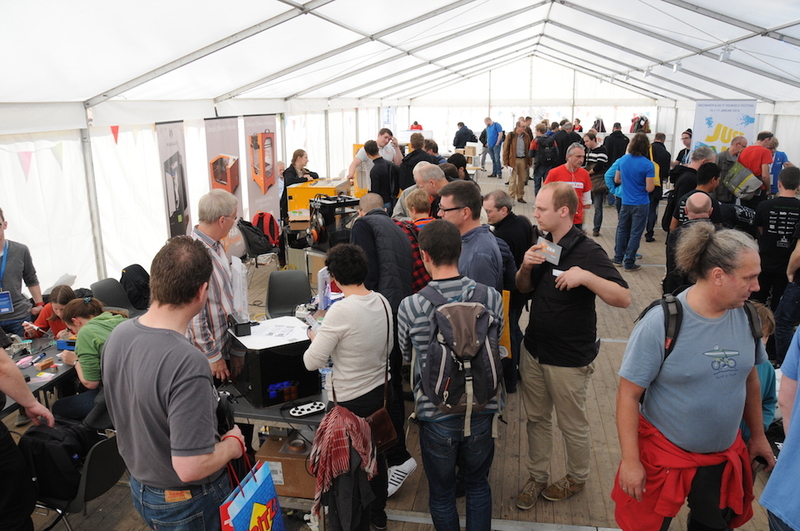 Vis-à-vis of our booth there was the presentation of racing cars. 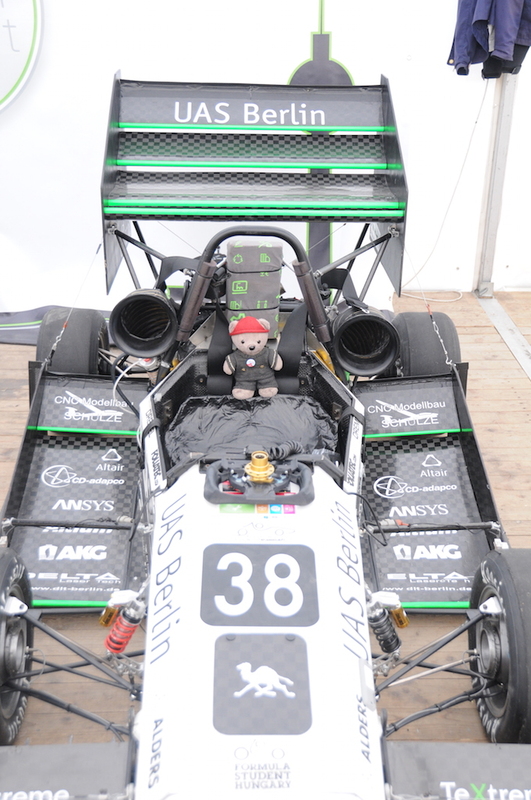 The guys and gals from the UAS Berlin allowed me to sit in one of their cars. Back in the building I found the people of Wear LEDs. Hope to get a blinking jacket later. And this was very funny! A mower controlled by an Arduino. 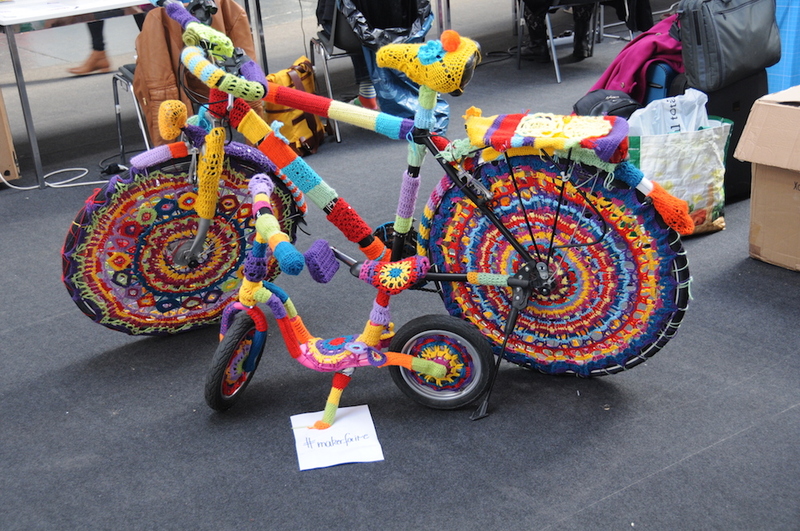 I had a lot of fun riding it. Mowing without effort. I wanted to stay there for longer, but my friend wanted to see more. 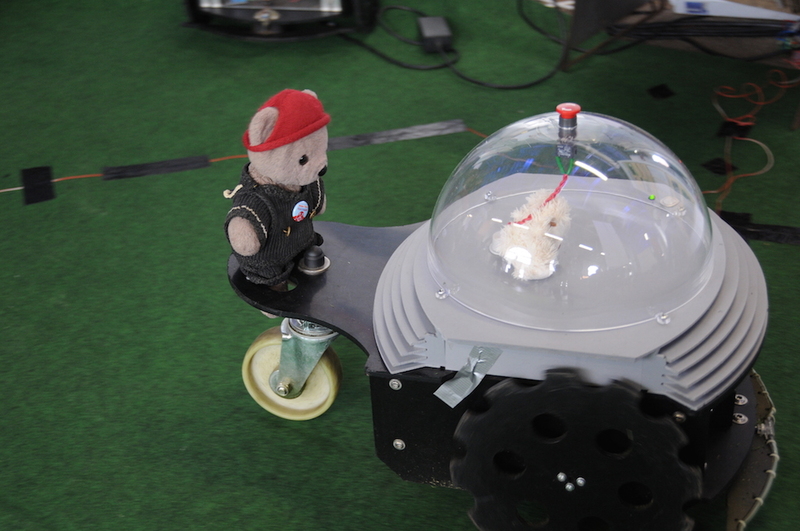 Then we visited Zoobotics. So easy to assemble and so much fun! I’m keeping my fingers crossed for him to find a distributor. Not far away I found the booth of the woodwalkers. 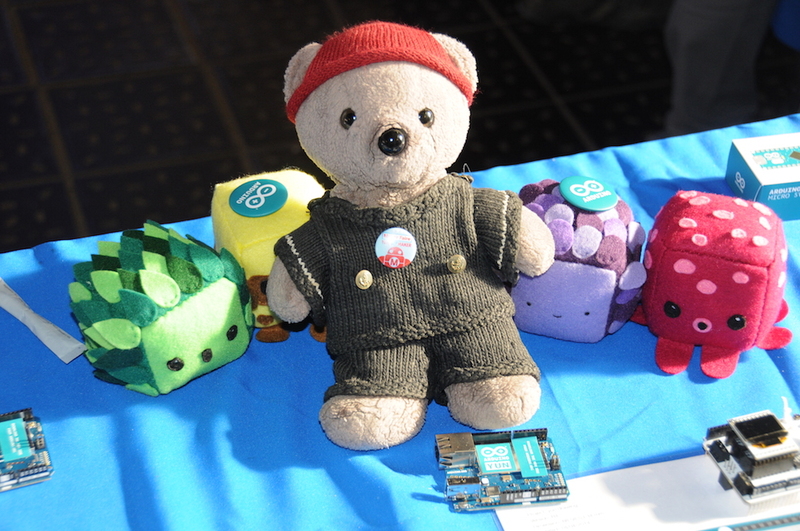 The creator is also a member of the Arduino group Hannover. I had a lot of fun playing with them. 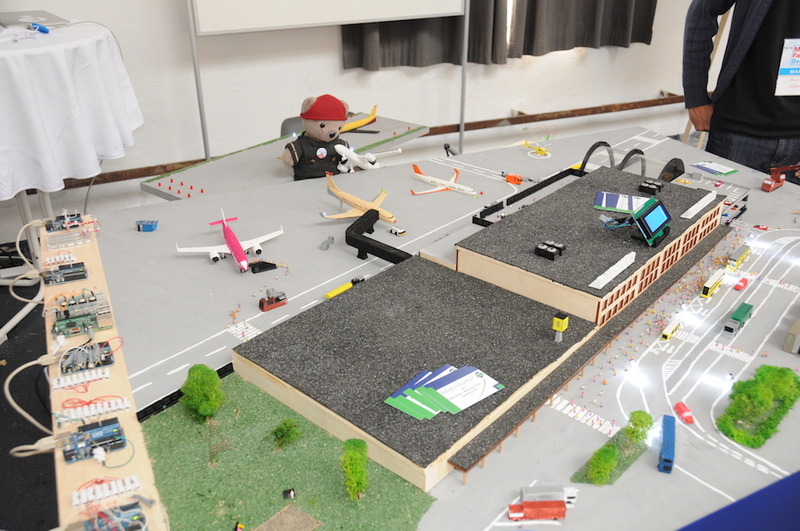 And then there was the next challenge: Air controller at Berlin Schönefeld (SXF). 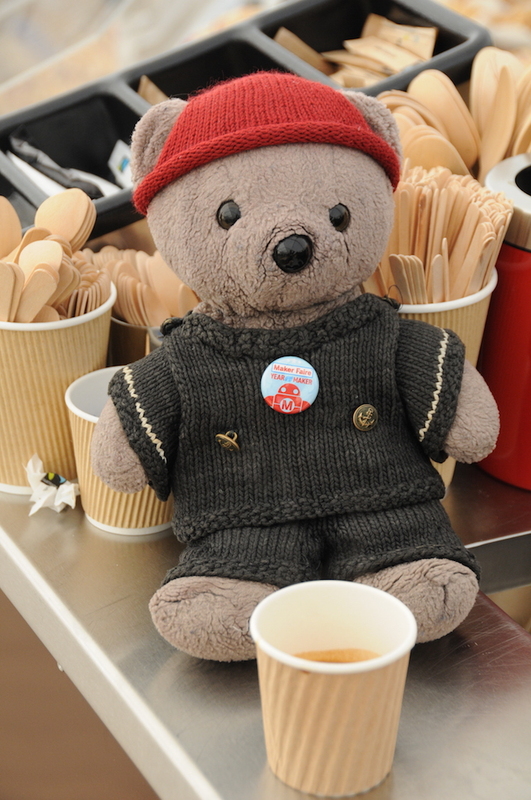 But that’s not my cup of tea – too stressfull. Fortunately I could save a plane from falling on the floor. A very nice gadget is the Hacklace from fab4U. (The tiny little things in front of me.) 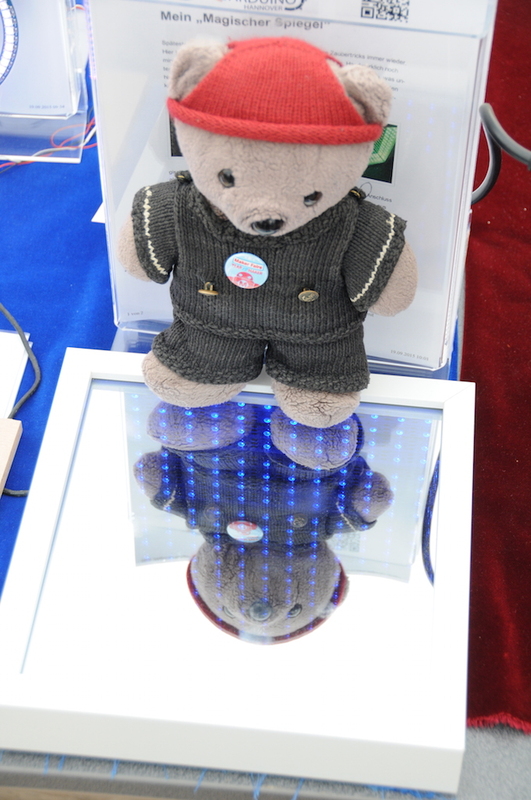 They have a tiny 8×8 LED matrix showing different patterns or text. But there is not only electronics. 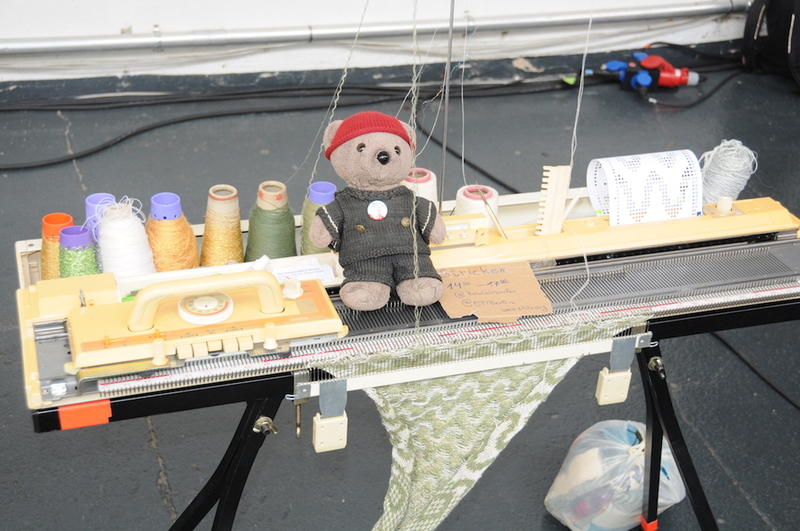 I saw a knitting machine (OK – even there was an electronic controller). 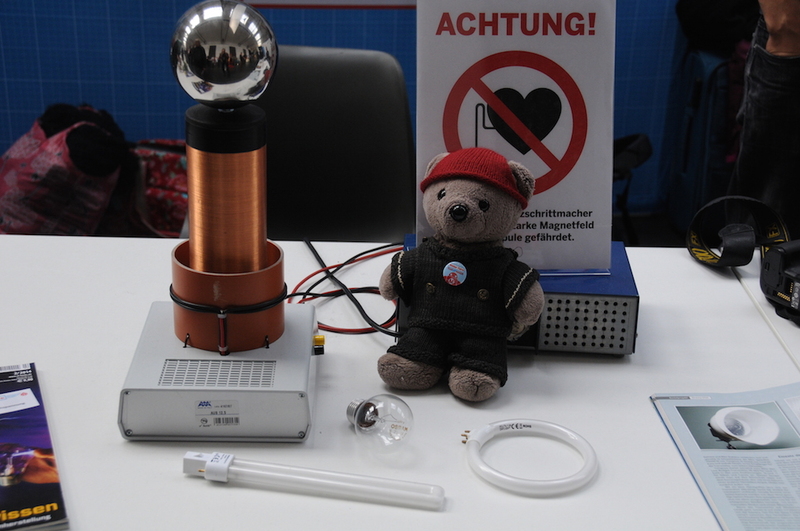 At the booth of the organizers – the Make: magazine Germany – there was tesla coil. Very dangerous, but I dared to come closer. 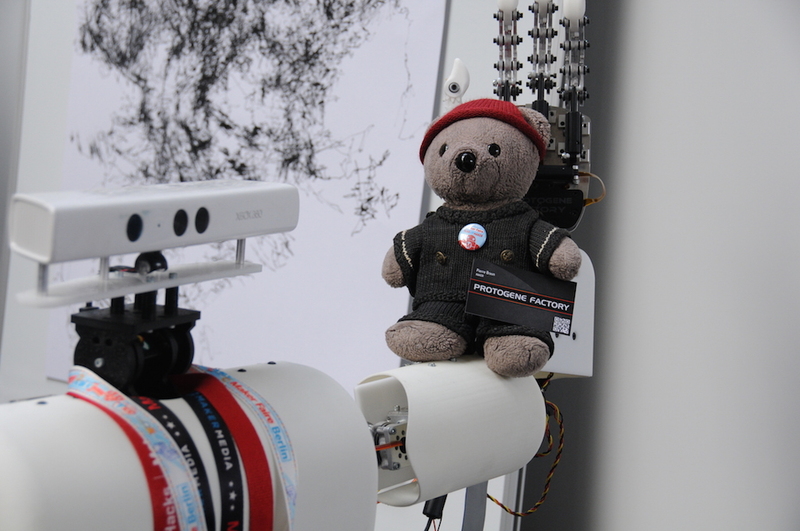 After my heart beat had normalised I visited an InMoov robot. He was very friendly and allowed me to sit on his shoulder. 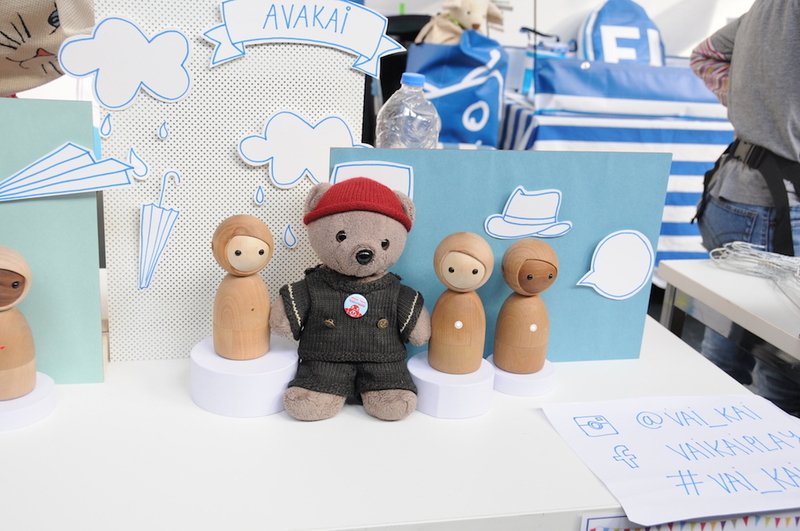 Not far away I found again new friends; the puppets from Vaikai. These are very nice toys for 21. century. Back in the tent I visited the colleagues of Make Munich. We hope to establish a sort of collaboration with them. And then there were the people of Urban Survival. 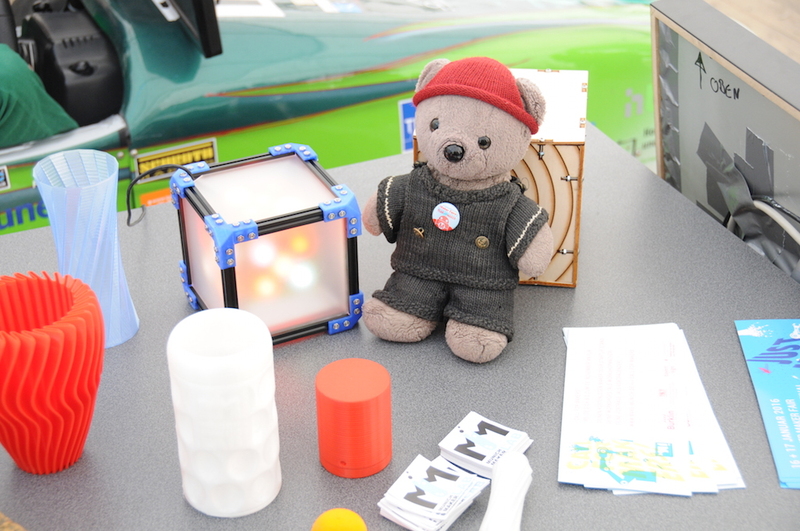 They create gadgets, which you can use to survive the everyday life in cities. 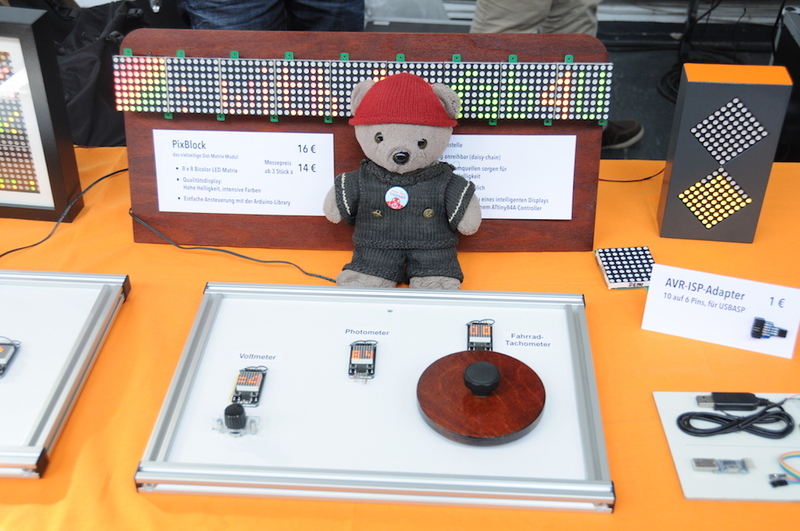 Back at the booth of Arduino Hannover I played a round Arduino ärgere Dich nicht. 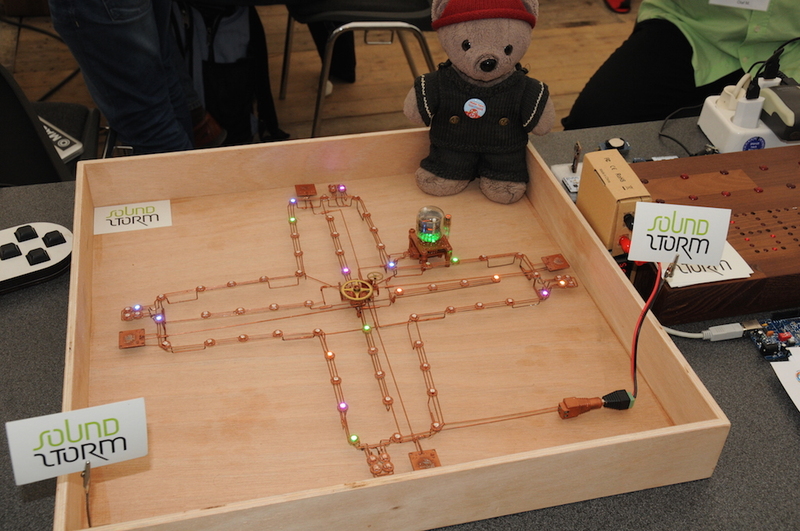 Luca created this in a steampunk design. Jeez! This is deep! I heard something about a whormhole generator, but I think that was joke. Wonder how this works. 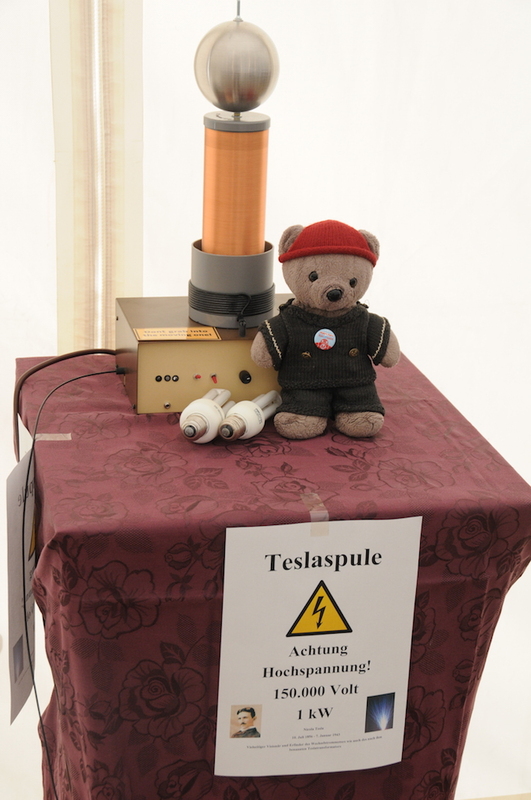 And again a tesla coil, this time the one of Olaf. 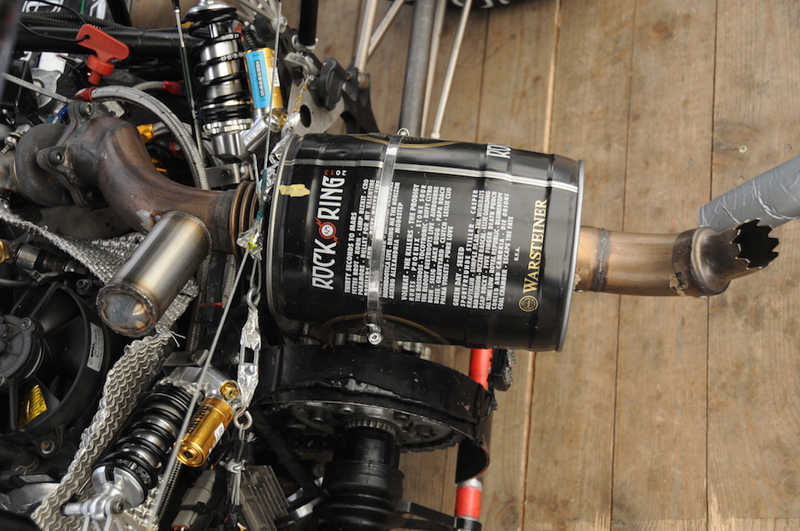 It is really loud and plays music. But then I had to go on tour again. I remembered, that I glimpsed some nice things out of the corner of my eye. My friend didn’t see them, and so he had to carry me again. First there was a very comforting thing from “The Art of Motion Control“. 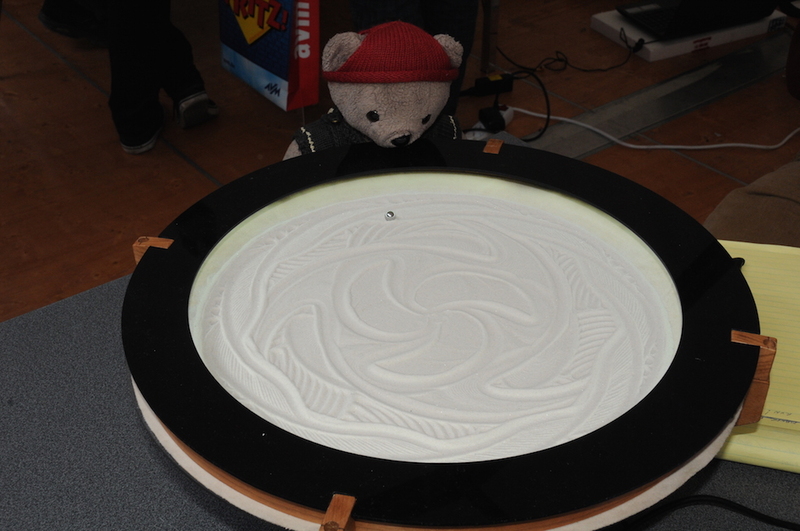 It was very mesmerizing to watch the moving ball creating figures in the sand. 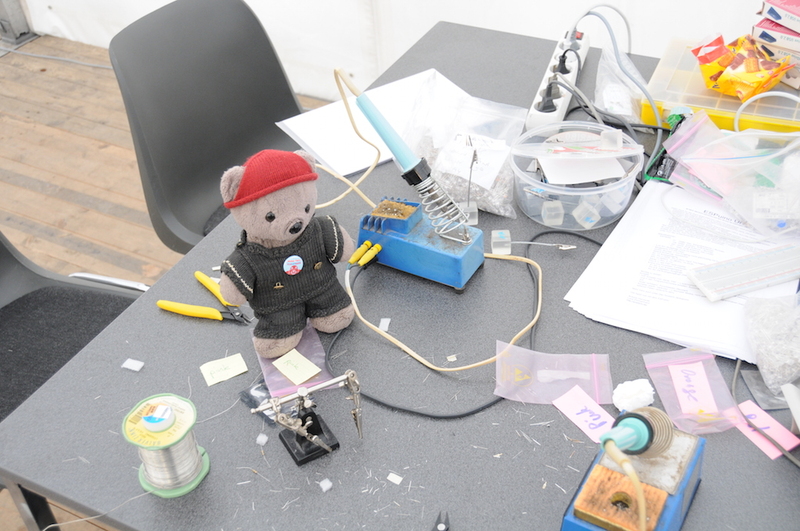 Back t the booth I wanted to participate in the soldering workshop, but I registered too late, so there were no free places. Phew! 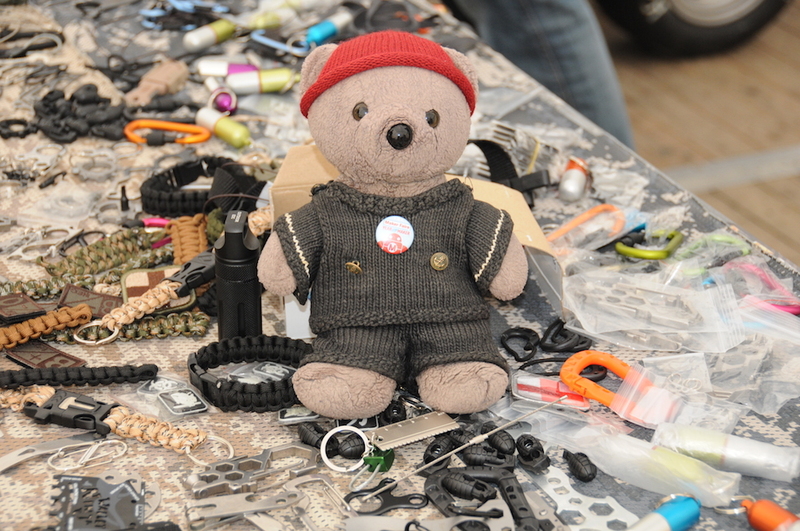 There were a lot of things to see. Time for a coffe at Electric Espresso! 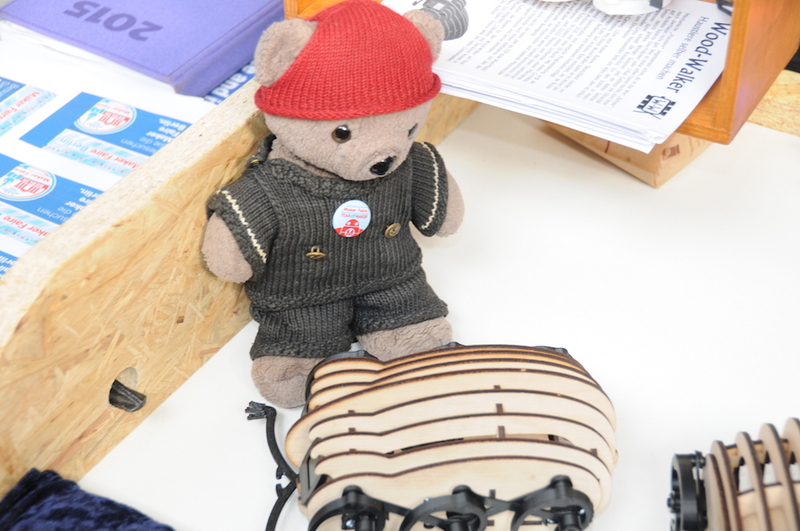 And at the end of the MakerFaire our booth got an award. 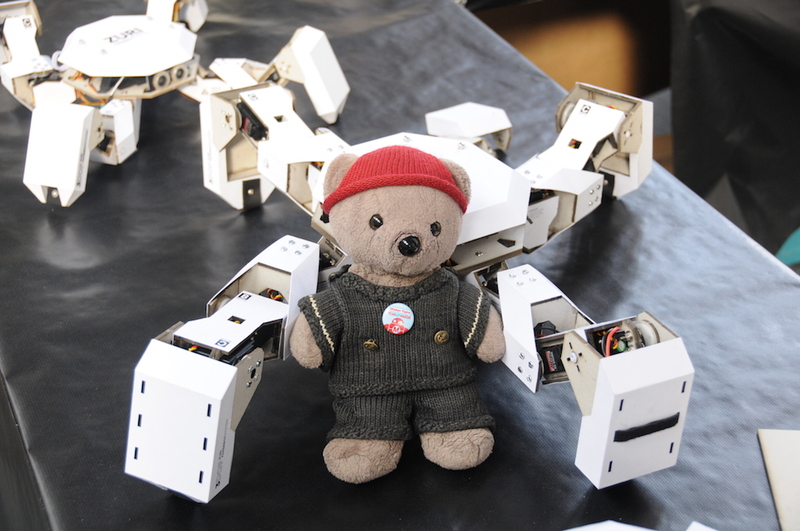 Can’t wait to visit the next MakerFaire! 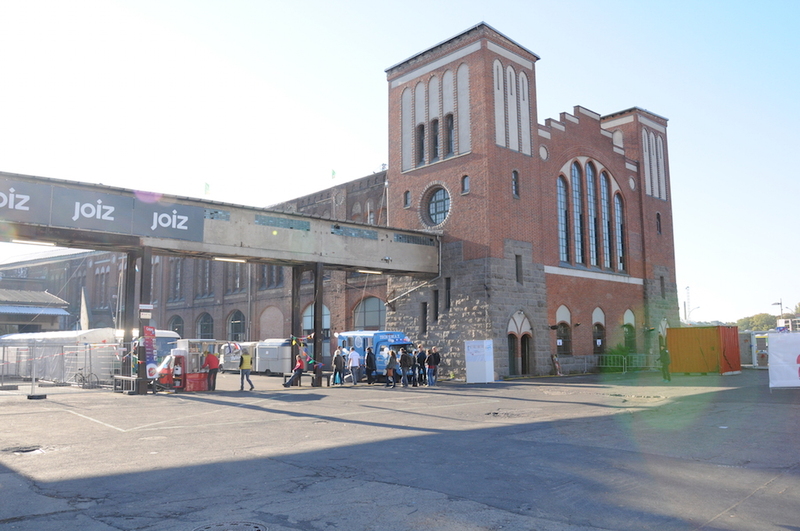 May 28 and 29, 2016 in Hannover.